Bouillabaisse is the most famous fish stew of the Mediterranean, and its home is considered to be Marseilles. Bouillabaisse was originally the fare of the local fishermen who on returning from a fishing expedition sorted heir catch : some to be sold on the local market , some to be kept to be eaten at home. When making bouillabaisse at least four of the following fish should be included: rascasse, white rascasse – fielas (congre), araignée (vive) – chapon (scorpène), galinette (rouget grondin) * facultative, Saint-Pierre cigale de mer, langouste. According to Curnonsky, there is a legend that bouillabaisse was first brought by angels to the Three Marys of the Gospel, when they were shipwrecked in the marshes between the two branches of the Rhone River near Arles. 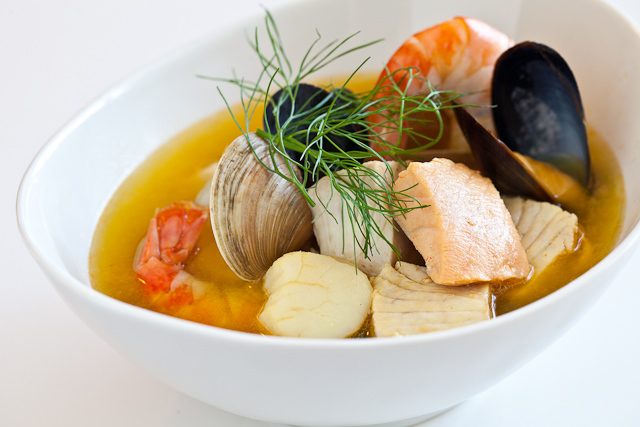 One of the earliest uses of the word bouillabaisse was in the 1830s as a term expressing the rapidity of the cooking. 1503 Nostradamus was born. Astrologer and cookbook author. He is best known for his book of prophecies ‘Centuries Asrtologiques’ published in 1555. However, in the same year he also published ‘Excellent er Moult Utile Opuscule a tous necessaire qui desirent avoir connaissance de plusieurs exq uises recettes’ (‘An excellent and most useful little work essential to all who wish to become acquainted with some exquisite recipes’). 1795 John Bloomfield Jarvis was born. A civil engineer, he designed and built the Boston Aqueduct and the 41 mile long Croton Aqueduct (New York City’s water supply for over 50 years from 1842). 1943 John Harvey Kellogg died. A physician, vegetarian and health food pioneer. He was superintendent of the Battle Creek Sanitarium, where he developed the first breakfast cereals for his patients, Granose (granola) and toasted flakes. His brother, William K. Kellogg founded the Battle Creek Toasted Corn Flake Co. to produce cornflakes. 1968 ‘I Heard It Through the Grapevine’ by Marvin Gaye hits number 1 on the charts. 2006 A bar owner in Bethalto, Illinois was charged with violating the liquor code and obscenity laws. The bar filled a children’s inflatable pool with mashed potatoes and staged wrestling matches. The violations came about when several of the female ‘wrestlers’ were rumored to have lost some of their garments to the surrounding carbohydrates. Love that photo – good enough to eat !!! !